Dale was nice enough to invite me to submit a guest entry on his Wooden Warriors blog. I was more than happy to do so. At first he asked that I do a tutorial on how I make the cloaks for my ancients figures. I thought I would do that as well as highlight the general process I go through, from idea to production, for the wooden warriors that I do. 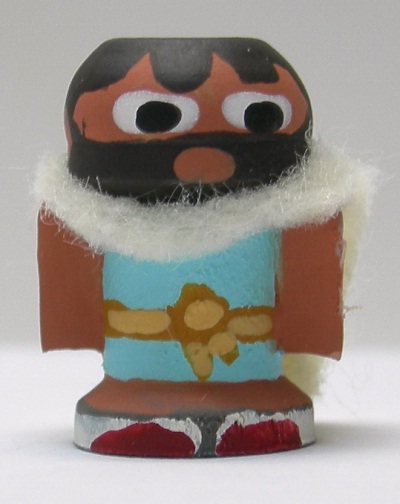 I have focused mainly on making figures for the ancients period, especially for the Greek, Macedonian, and Persian armies of the early and late Classical period. So I thought for this guest spot, it would be best to focus on my strength and do one of those figures. I have been putting together armies for some games involving the Wars of the Successors that followed the death of Alexander the Great. 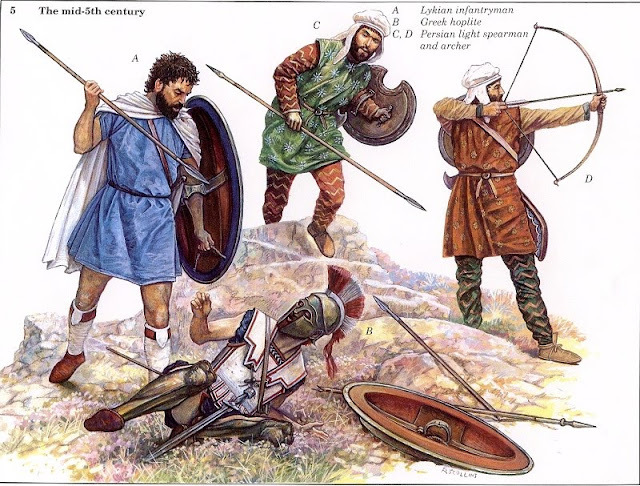 One of the interesting troops that is mentioned as serving in several of the armies of the Successors are Lykian (sometimes spelled Lycian) infantry. 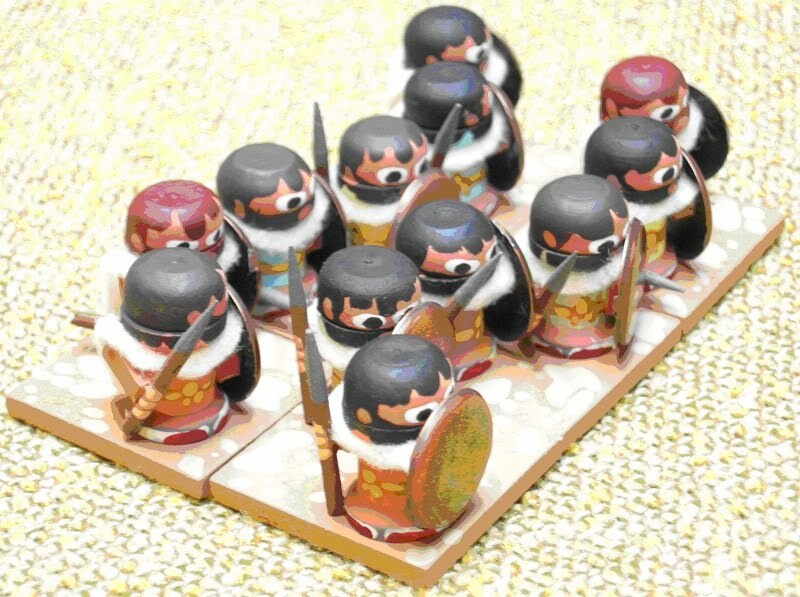 I decided that I needed a unit of these fellows for my Antigonus army, so I committed to make at least one unit of these interesting soldiers. The first step that I take when making a Wooden Warrior is always to find a good illustration. Osprey titles are usually a good way to go, but the illustration I found of a Lykian infantrymen is from classic book by Duncan Head, The Achaemenid Persian Army, is what I used. I have included a scan of the image below. He’s the fellow standing on the far left of the picture. After finding a good image, I carefully look at it. With Wooden Warriors at the scale I am doing them (they are about 1" tall or roughly equivalent in height to a 25mm standard figure) it is best to focus on the two or three most defining features of the soldier on the Wooden Warrior. You cannot get all the details onto the figure, so it is best to include those that will have people saying, "hey, that’s a ______" when they see your Wooden Warriors on the table at a convention. For the Lykian infantrymen, the cloak, shield, and leg covering, along with the lack of a helmet, are the most defining features. 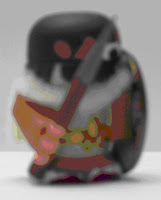 These are easy to do on a Wooden Warrior except for the leg covering. As you’ll see later, I had to compromise a bit. 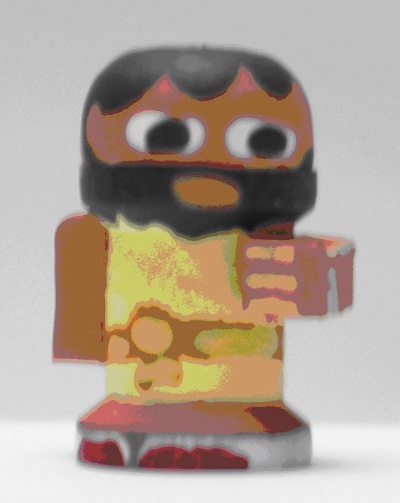 The next step is to actually make the Wooden Warrior. Although it would seem that the most important step is painting it, the actual construction is a very important step. 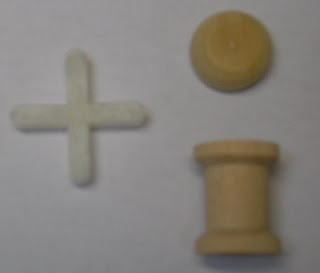 There are many possible combinations of caps, spools, and other wooden pieces that can be used to create a Wooden Warrior, and not all of these combinations will represent the actual soldier equally well. I like the look of a "squatting" heavy infantrymen at the ready, so I use a single 5/8" by 1/2" spool as the upper and lower body of the soldier. For the head, given that the Lykian in the illustration is shown without a helmet, I chose to use a 1/2" end cap. I glue the end cap onto the spool first, and then glue the arms on after the cap has dried. For arms I use the tips of a 1/8" tile spacer. You can get four arms per tile spacer, so it is pretty inexpensive. The flat side of the spacer is good for the end of the arm where the hand will be. The rounded side of the spacer makes a good shoulder or elbow. I vary the position of the arms to give the unit visual interest. Do not worry too much about the position of the shield arm as it will be covered up by a large hoplon-like shield in the finished picture. The final version of the figure will have a spear made from a round toothpick and a hoplon-like shield, made from a scrapbooking brad. 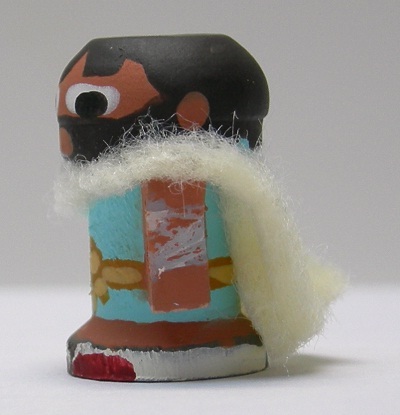 Also a cloak made of felt will round out the figure. However, it is easier to paint the figure completely and then add these details at the end. 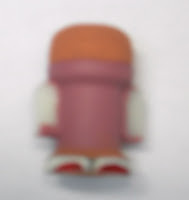 It’s not easy to see in the picture to the left but the flat sides of the tile spacer arms are towards you. I generally paint all the base colors onto the figure, and then go back and paint them all again. The first benefit of two coats is that the wood will absorb the paint of the first coat quite readily. While this is great as far as making it hard for you to chip the paint job on your figure, this also makes the paint color look faded and irregular. The second benefit that painting two coats gives you is it allows you to neaten up the lines between the colors, making them crisp and distinct. 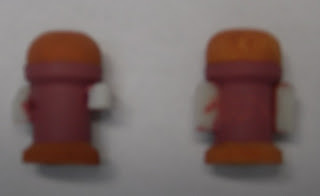 The picture below is of a figure on the left that has two coats and one on the right that has one coat. It is easy to se the benefit as far as color brightness and consistency that two coats gives over one. This seems like it would add a lot of time to doing the figure, but it really doesn’t and it greatly improves the overall look of the figure at the end, so it is a step that is definitely worth it in my opinion. When doing Wooden Warriors at this scale the more simple you can make the paint job the better. As you can see I do one color for the flesh tones, one color for the tunic, etc. Below is a picture of the final painting of the figures flesh and clothing. As you can see I added a feature at the bottom to represent the interesting leg covering the Lykian is portrayed as wearing in the illustration. Eyes and hair are very simple and added later. I only paint the eyes once, but the hair I paint twice just like the other parts of the figure. The type and size of eyes is very much left up to you as some people like a larger eye while others like a smaller one. Taste in hair is also very individual but I do recommend with this figure since the beard is such a prominent part of it that it take up a large area on the figure. As can be seen in the picture below I carried the painting of the beard down onto the spool itself to give it prominence. I would also paint a belt onto the figure at this point if you plan on the figure having one. The painting phase is more or less finished at this point. I added some "fingers" by using a lighter flesh tone on the hand holding the shield as well. Waiting to glue the spear and the shield on until the last step is a good idea because if you do not do this, adding in the cloak will be unnecessarily challenging. The method I use to make a cloak is very simple. To get a good mental picture of what I am trying to do, I always think of the cloak as having a middle section and two "wings" corresponding to the arms of the figure. The middle section is sort of the back drop and the wings overlap the middle section. This gives the cloak a look of depth. The middle section is a simple square or rectangular piece of felt. The wings are actually made with one piece of felt cut into roughly a "U" shape. The bend in the "U" goes around the neck of the figure and the two "tails" of the "U" fall over the arms and down the back of the figure. The first step in making the cloak is to glue the middle section to the figure. I do not have precise measurements for this and in fact sometimes go back and trim the cloak after I’ve glued it to the figure. For the Lykians, I decided that I wanted the cloak to be not quite to the bottom of the figure. The width of the middle section is somewhat more specific. It should be the same width as the area on the back of the figure between the arms. If you do make a mistake in width of the middle piece, it is better to be too wide than too narrow as a "bubble" in the middle section will not interfere with the appearance of the finished cloak and, in some cases, can actually give it a little more character. The picture below is of one of the Lykian figures with the middle section of the cloak glued into place. I use a superglue to glue the cloak to the figure because it needs to dry quickly in place. I put a dot on the spool where it meets each arm and a dot in the middle of the spool and press the felt into place. Making the middle section of the cloak is very easy. The trickier part is the "U" shaped piece that will be the front and wings of the cloak. The picture below takes you through the three-step process in making this second piece of the cloak. Begin with a rectangular piece of felt that is roughly the same width as the figure is from arm to arm, and long enough so that it will go from under the "neck" of the figure over the arms and down the back. Again, I do not measure this exactly. Instead I make it a little too long and then once I glue it to the figure I trim it to fit. After you have the rectangular piece in hand, start in the middle of what will be the back or bottom of the cloak. Cut a teardrop shape out of the rectangular piece. Alternatively you could literally cut a "U" instead, but I like the angle created at the back of the cloak if a teardrop shape is cut rather than a simple linear "U" shape. After the teardrop shape has been cut and removed, go back and trim off the squared edges, making them round. 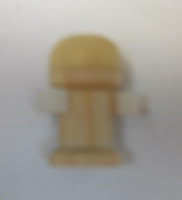 As a visual aid, in the picture the top part of the piece will be under the face and across the shoulders of the figure, so you want this to be as rounded and as thin as possible. Be careful: craft felt can be much weaker than it looks and if you cut it too thin it will tear in half. 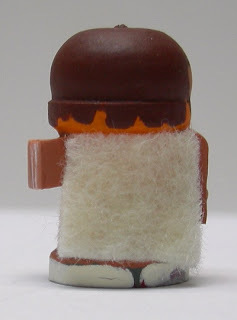 Now that the second piece of felt has been cut you can glue it to the figure. 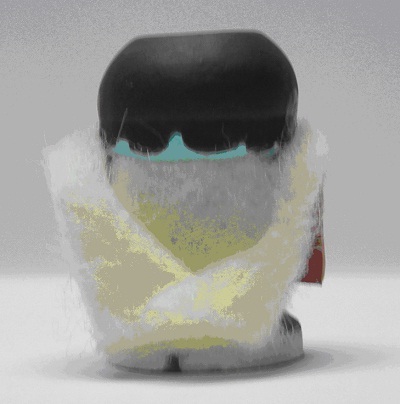 Put a drop of superglue on the front of the figure where the spool sticks out but not all the way up on the face of the figure. Carefully place the second piece of felt so that the middle of the rounded part of the "U" shape is on the glue. Push down on the felt where it meets the glue so that it is glued flat onto the figure rather than having it stick straight out. Take a look at the first picture below to see what I mean. The rounded part of the felt lays down flat and looks like it is under his chin. Once the glue dries put a drop of glue on one of the shoulders of the figure. Pull the wing of the felt piece fairly tightly over the shoulder of the figure on that side and push down on the felt where the glue is. Do not pull too firmly, though, or you will tear the felt. In the next picture below you can see what I mean. The cloak looks like it is resting on the figures left shoulder. You can also see in this picture that I scraped some of the paint off the arm on this side. That is so the shield will more permanently glue to the figure when I get to that step. When the glue dries repeat this step for the other shoulder of the figure. Finally it’s time to glue the ends of each of the wings to the middle section of the cloak. In the next picture below you can see what I meant before about how cutting a teardrop shape rather than a simple "U" shape creates a more visually interesting back to the cloak. Put a drop of glue on the middle part of the cloak on one side and pull the wing section on that side done and touch it to the superglue. Do the same thing for the other side. Once it dries, if you think the cloak is too long it is very easy to trim it if need be. The final step is to glue the shield and spear onto the figure. I suggest you glue the shield on first. The shield that I use is actually a brad. You can get one at a scrapbooking store. They are used to hold pieces of paper together, so they have these flexible sharp-ended arms on each side of the piece that will serve as the shield. See the picture below. These arms are very easy to remove. I use a pair of needle nose pliers and grab each of the arms at the point where it meets the round part of the brad and bend it back and forth until it breaks off. On the larger brads like this one, though, you can actually use your fingers. The brad on the left in the picture still has its arms. The brad on the right has had its arms removed by the above method. Just put a drop of superglue on the part of the left arm of the figure where either you did not put any paint or you scraped off any paint that got onto the figure. The brad will join very well to the naked Teflon of the tile spacer arm. It will also glue onto paint, but the paint readily breaks away from the tile spacer arm if any pressure is put on the shield. So it is best to have no paint on the area of the arm where the shield is attached via the superglue. For the spear, take a regular round toothpick and cut it in half giving you two spears. Take one of them and trim the end that is not pointy so make the spear as long as you want. For hoplites, I usually don’t alter the length at all. But for javelins and the shorter spears like those carried by the Lykians I shorten them a bit. Paint the spear and then put a drop of regular white or other slow drying glue to the squared end of the other arm and put the spear into place. Once the glue dries take your flesh color and paint over the spear roughly where the figure’s hand would be. 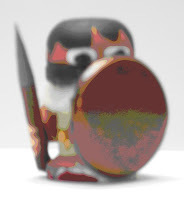 This will give the appearance that the figure is holding the spear. You can even use a lighter flesh tone and paint fingers on after the flesh tone has dried. You can see this in the pictures below. The picture below is an "action shot" of my completed unit of Lykian heavy infantry, ready to fight for Antigonus. Compare them to the scan from Duncan Head’s book that I included below. You be the judge! Thanks Matt for that great tutorial. If there is anyone else out there that would like to submit a tutorial for publication on this blog, please let me know through email or through comments to the blog. I like to focus on soldiers made from wood, but will consider any Do-It-Yourself material or method. I like the cloak idea.